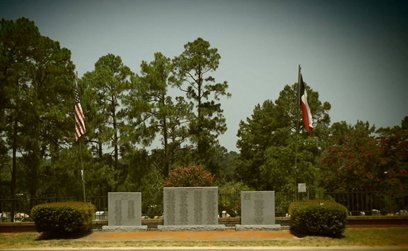 Overton Municipal Cemetery | Welcome to Overton, TX! Per City of Overton; ORD NO20170119A Amending Cemetery Rules Benches are not allowed in the Overton Municipal Cemetery unless they have been approved by the Cemetery Staff and meet the current regulations as outlined in the Ordinance listed above. Benches not in compliance with this Ordinance by August 18, 2017 are subject to be removed by the City of Overton. Please note: Any items removed by the Cemetery staff will be retained at City Hall for a time that is determined to be administratively viable. The Overton Municipal Cemetery was first established in 1874 when the Railroad donated the first two (2) acre tract of land to the City of Overton for use as a City Cemetery. The land must have been previously used for burials as the oldest head stone has a date of September 21, 1861. The Cemetery later received additional land donations and is currently documented as containing and estimated 7.25 acres. 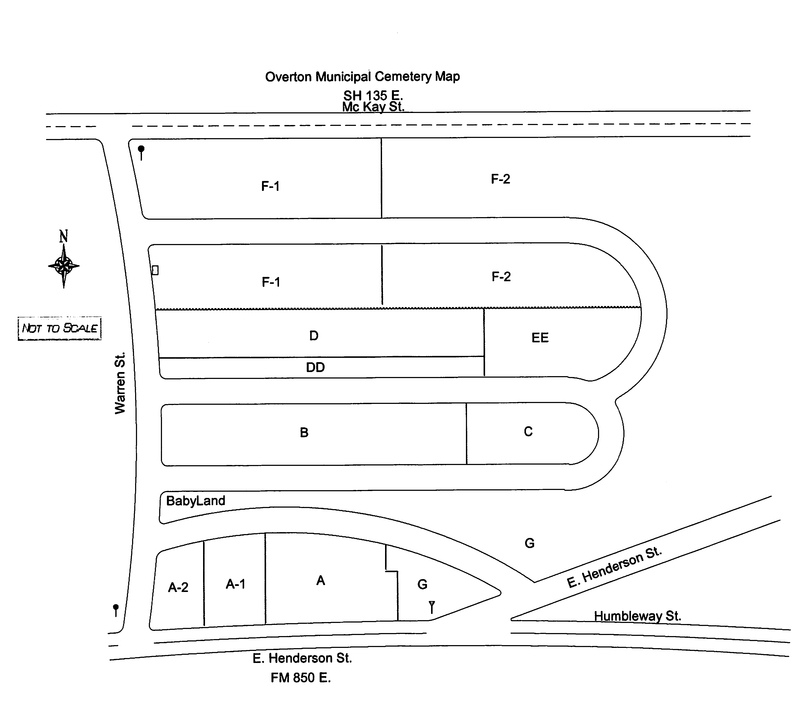 The Overton Municipal Cemetery, located at the corner of Warren Street and Henderson Street (FM 850), has four (4) levels with four (4) separate vehicle entrances to the cemetery as you proceed down Warren Street from Henderson Street (FM 850) and one vehicle entrance from Henderson Street. The Cemetery contains twelve (12) separate sections: Sections A, A-1, A-2, Baby Land & G are located on the first level closest to Henderson Street (FM 850); level two contains Sections B & C; level three contains Sections D, DD & EE; and level four contains F1 & F2. The City of Overton formerly accepted trusteeship of the Cemetery from the Overton Cemetery Association in October of 2011. City Staff works very hard to update old records of burials and plot owners for the cemetery. If your family has family members buried in the Overton Municipal Cemetery you may wish to contact the City to verify that we have your family’s graves documented accurately. The City of Overton wasn’t left with any sort of endowment fund to assist with ongoing Cemetery maintenance. The Overton Cemetery has been maintained for the past 150 plus years largely through donations from families who have family buried in the Cemetery and care provided by family members for individual grave sites. The Cemetery has had very limited donations over the past several years. If you would like more information on how to make a tax deductible donation to the Overton Municipal Cemetery please contact Rachel Gafford by email at (rgafford@ci.overton.tx.us) or by phone (903) 834-3172. 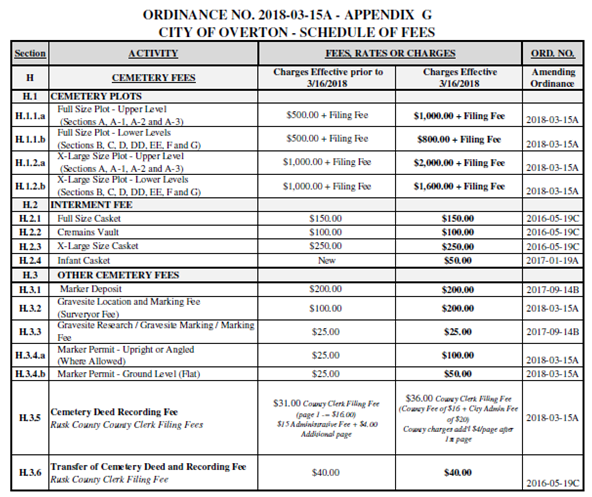 Below is the current Overton Municipal Cemetery fee schedule. If you are interested in purchasing a cemetery plot or requesting burial in the Cemetery please contact the above named City of Overton staff members.